Big tastings has become a bit of my speciality. My initial idea wasn't to present a tasting with 20-25 bottles. No, my idea was just to to a normal tasting with 6 whiskies, but with tim the idea grew on me and it became a big tasting instead of an ordinary one. And I didn't stop at just ONE big tasting, I did THREE of them the same year! To take it from the beginning, my first idea was to do a fun Ardbeg-tasting. When Ardbeg releases their Very Young, a six-year old (young) whisky which was the first step to the new ten-year old entirely produced under Glenmorangie's ownership. It was supposed to get another three in the same serie counting down to the new TEN. 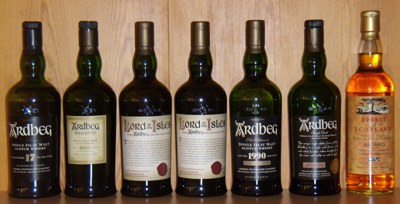 I thought it would be a fun tasting to have the old TEN together with the new one and the four whiskies between them. So I bought a couple of bottlesof the Very Young and the next year I bought some Still Young when it was released. A fun thing about the release of Still Young is that at the time there was a discussion on whiskyforum.se about what the last two would be called. I said Not So Your Anymore and Almost There. Ardbeg changed their plans so there was only three releases instead of four and the last one got the name Almost There! I'm still waiting for my royalties for that name. It was still a year to go until the new TEN was supposed to be released and my initial idea had now grown to something bigger. Why not do a really big tasting with lots of Ardbeg bottles in one day?I had bought some other Ardbeg bottles and back in 2007 they were still nicely priced. It's lucky I din't know about the coming prices because then maybe I hadn't open all those nice bottles on the tastings. I picked a nice line-up with 22 different bottles and sent out an invitation 13 months ahead of the when the tasting was supposed to be held. I was very surprised to see that the tasting got fully booked in less than 24 hours! I had doubles of a lot of the bottles so I decided to do a second tasting two weeks after the first one. This time it took 36 hours for the tasting to be fully booked. This was 13 months ahead of when the tasting was going to be. "Try to stop me from coming, I would pay to be a part of it!" 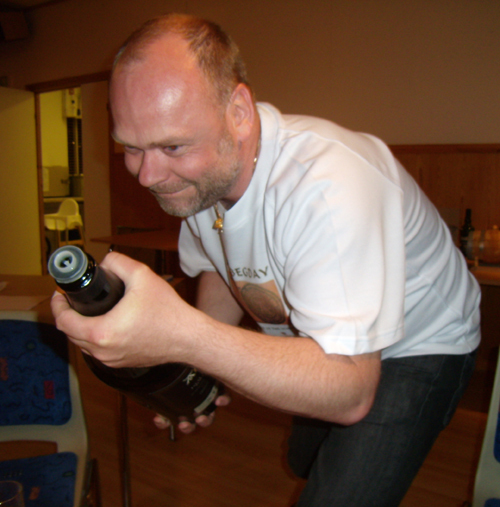 In June 2007 I bought a bunch of bottles from a very nice danish guy that I today call my friend. It was no other than Martin Markvardsen. These bottles gave me the opportunity to arrange a third tasting. The date was set to November 2008 and inviation was sent out in June 2007. This time it took 48 hours until all seats were sold. The first tasting took place May 17th 2008. One problem occured. The new TEN wasn't just a new TEN release. Ardbeg released Renaissance We're There as the introduction of the new TEN. But the release was later than expected so at the first tasting we had to cope without it. It was released in Sweden on June 2nd, so it looked like we were going to miss it by two days on the second tasting too, but Kitten managed to get hold of a bottle so we could include it for the second tasting. May 17 arrived and it was a beautiful day with lots of sunshine, but none of the 35 participants complained over having to be indoors all day drinking Ardbeg. This was the first time i organized this kind of tasting with this many bottles. This tasting has later become the model for my big tastings. 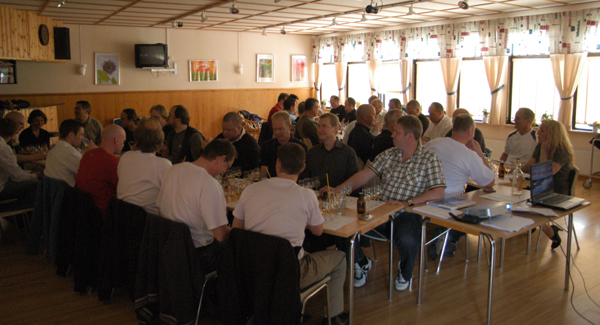 There is qute a bit of logistic to consider with glasses and food and it takes effort from the participants to handle 25 whiskies in a day. Makesure to have a big lunch before the tasting. Drink a lot of water during the tasting. Make sure to eat properly in the foodbreaks. Bring a bottle to pour your leftovers in. We started the tasting at 2 PM. Kitten held a short introduction to Ardbeg and the we tasted the first flight until about 4 PM. Then we had en hour foodbreak. Bread, butter, spreadings and coffee was available so everyone could do their own sandwiches. In the break we also had to wash all the glasses, get them out, pour next flight and put all the glasses back in place. There is a restaurant dishwasher available so it is done quite easily. After another two-hour tasting session a buffet is served in the second foodbreak and then we end the tasting with another two-hour tasting. After eight hours of tasting we were done around 10 PM and 35 very happy participants could start their journey home. Most of them carrying a unique litte bottle of Ardbeg with their leftovers from the day. We did serve 50 cl to everyone (this was before I found the 1,5 cl pourers), so most people had some leftovers in their bottles. This is what was served on May 17, 2008. As I didnt' had doubles of all the bottles we had to change some of them for the second tasting at May 31. 1990 for Japan was replaced by the 1978 and the 1972 cask 2782 was repleaced by 1974 cask 2741. We also added the Renaissance so we had 23 whiskies on the second tasting instead of the 22 we had on the first one. Kittens birthday is May 31 and as she is born the same year as I am, 1965, I added a Glen Mhor 1965 to start the day with a toast for Kitten. Six months later, November 15th 2008, it was time for the third and last tasting. Kitten once again came to Påarp to host the tasting, The day after she left for Thailand. She was supposed to travel before the tasting but she changed her flight so she could be with us for the tasting! 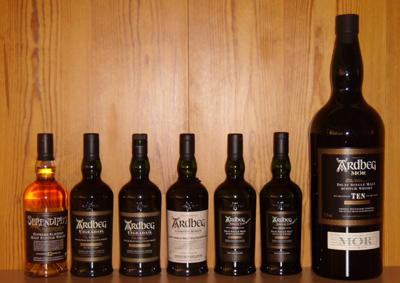 2008 was really a big Ardbeg-year!